Infertility plagues women across the nation at rates many would find unbelievable. Resolve.org reports that 1 in 8 couples struggle with infertility. Take the science out of it and we can all probably say that we or someone we know well has struggled to conceive. But what about secondary infertility, when a woman struggles to conceive following a successful pregnancy? This less talked about issue is dealt with by countless moms as well and, if you are someone who has faced it, you probably understand the unique position women facing it are in. Secondary infertility is defined as one’s inability to conceive a child, after having at least on child in the past. This inability could be due to a new partner situation or when one or more partner develops fertility issues following the birth of their first child. Sadly, millions of families will face this issue and will struggle to find assistance, guidance, and support. My first pregnancy was unplanned. Just out of college and in my first year of teaching middle school, I discovered my college boyfriend and I were expecting our first baby. It was a blessing in disguise that resulted in major changes and more joy than I could’ve imagined. After a traumatic birth experience that caused sever bleeding, uterine rupture, and complications for my son, I was told not to even attempt a second pregnancy until 2-3 years postpartum. When my son was 2 and a half, we decided to start trying. Month after month we were disappointed and, talking to friends and family, everyone encouraged us to keep trying, not to worry, stop stressing -all of the things people say to young, seemingly healthy people, who are trying to conceive. I was young, we needed to time it better, I shouldn’t stress, it would happen. Months went by before I sought help again. This time I went in armed with research and questions. Only the result was similar -it may take time, you’re stressing yourself out, maybe try to lose weight. And, most hurtful of all, I recall the doctor saying I should just, “be happy.” I already had one baby, I should focus on being grateful for that and let “nature take its course”. I remember feeling so much guilt about wanting another child. I had friends who were going through infertility treatments trying to conceive their first baby and I remember always feeling like I couldn’t say anything to her about my struggle -because at least I had a baby. And I was so grateful for him! Of course I was. I loved being a mom and I so desperately wanted to have another child to mother. I tried to focus on mothering the child I had -we joined play groups and mom and me classes. I went back to school, figuring I needed to take a break, maybe think about moving on. Only, people were constantly asking us -when are you going to try for a girl? When are you going to give him a sibling? Didn’t we know it was better to have them closer together?! As graduation neared, I decided to try again with the doctors. We’d purchased a home, moved to a new town, and I thought it was time for new start. And my new doctor did too. She was supportive, she was understanding, and she wanted to start with some moderate treatments. Twice in fact -we had two babies in the following four years! 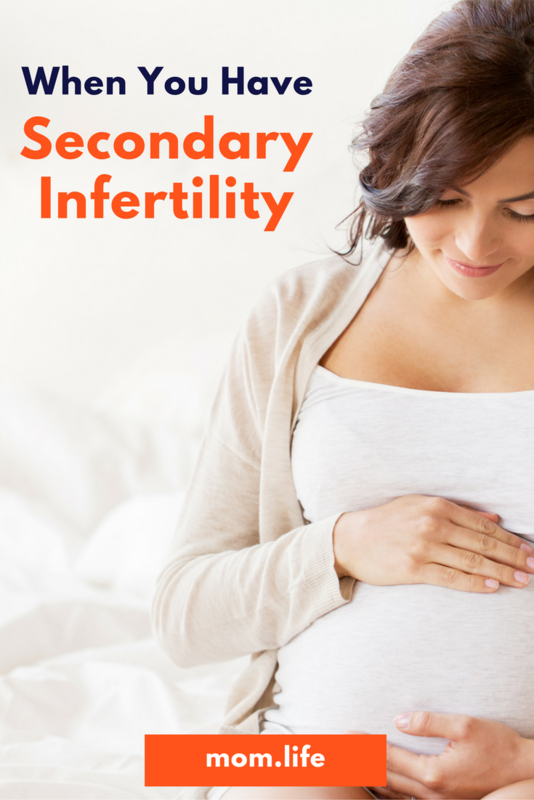 If you’re facing secondary infertility, here are some things to know. You’re not selfish or insensitive for wanting another baby. Your feelings are valid and they should not be dismissed, nor should you be made to feel badly. Or find a new one. Your ob/gyn should be sensitive to your concerns and, truly, you may be suffering a medical condition that is preventing you from getting pregnant. My doctor discovered that I had Polycystic Ovarian Syndrome and helped regulate my cycle so that I could conceive. You don’t have to wait years to seek assistance from your medical professional. If you feel like something is wrong, you’re probably right! If you’re comfortable. Or just tired to of getting asked about baby #2. I was pretty quiet about it because I just didn’t know what else to say, but I feel like it would’ve helped relieve some pressure if I had friends to talk about my feelings to. The mom.life app is a great place to start! Our app is filled with supportive women who are eager to provide support and encouragement to moms in need. Join us there and find your tribe. Read More: What to do when things when your pregnancy ends in miscarriage.